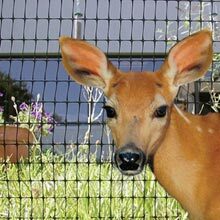 Keep deer and other wildlife out of your garden and orchard areas with our "do-it-yourself" Fencing System. Use our low-cost solution to your deer problems to keep deer off your property — greatly reducing the risk of Lyme disease. Our Poly Mesh Netting is lightweight, easy to install and ideal for our Deer Fencing System and as anti-bird screen. Rolls are available in 1/2" x 5/8" mesh, 11/16" x 1-1/8" mesh or 3/4" x 3/4" mesh and are manufactured from black UV plastic for long life and durability. A. When using our 19 gauge, 1.05" OD galvanized 6', 8' or 10' fence posts (105368, 104573 & 105S123), we recommend installing at a maximum of 6'-10' apart. Use our 2' Ground Post (104543) and Driver (104545) for easy installation. Insert ground post 2' into ground. Place fence post inside it. Finish off each post with our 3/4" Schedule 40 PVC End Cap (WF2990). We do recommend our Corner Post Assembly when using our galvanized fence posts. Our Fiberglass Fence Posts are available in 6', 8', 10' and 12' lengths, designed for long life and are an excellent alternative. Manufactured from E-glass fibers that allow for flexing without breaking. UV protectorant is put on each fiber on both interior and exterior post. Flexible as bamboo, but will not rot or fray. Strong as steel, but will not rust. Sold in bulk packaged quantities of 10. We recommend installing Fiberglass Fence Posts at a maximum of 6'-10' apart. Ground Posts are not needed when using Fiberglass Posts. B. Use either galvanized steel (AR1030) or stainless steel (AR3030) 1/8" 7 x 7 cable as a guide wire at top to support your deer fence. 1/8" cable clamps, either galvanized (AS1002) or stainless steel (AS1026) are required. C. 4" UV-resistant black nylon cable ties (112047) hold the cable to the fence along the top. 8" UV-resistant black nylon cable ties (FABP60) hold the fencing to the posts. Both are strong and durable and will last for many years. D. Brightly colored yellow flagging ribbon (LJ7802) tied to your fence will warn deer of new barrier. E. 1-1/4" stainless steel fence staples (FA3390) hold the fencing to the trees surrounding the area to be protected. No rusting. F. Use our 12" heavy-duty ground staples (104544), spaced closely, to hold netting firmly to the ground. Properly constructed deer fence poly netting systems completely encloses gardens or orchards, leaving no openings. Openings allow deer to venture into the area which can lead to greater damage as the animal is cared and attempts to escape. Fencing staples and galvanized conduit posts should be used to ensure that fencing is pulled tightly. It is recommended that galvanized ground staples be used every 12 feet to keep deer from crawling underneath and that you attach flagging ribbons at 3 to 5 feet high and every 4 to 12 feet so that the deer see the fencing. After a few months, this can be removed when you are sure the deer are aware of the fence. When deer encounter our fencing, they are unable to determine how tall the fence is and thus are unable to properly gauge the required take-off and landing required to circumvent the fence. From the eye level of the deer, the fence appears to be much higher and coupled with the poor visibility of the fencing, deer are kept out of your precious garden or orchard. Have questions about Deer Fencing? Visit our Live Help page or Contact Us.